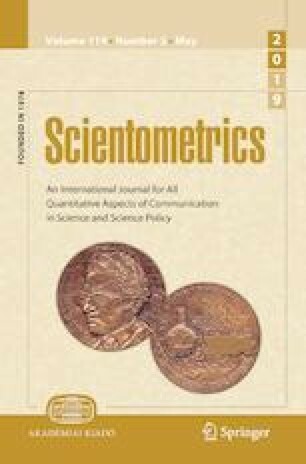 Patterns of interdisciplinarity in science can be quantified through complementary dimensions. This paper studies as a case study the scientific environment of a generalist journal in Geography, Cybergeo, in order to introduce a novel methodology combining citation network analysis and semantic analysis. We collect a large corpus of around 200,000 articles with their abstracts and the corresponding citation network that provides a first citation classification. Relevant keywords are extracted for each article through text-mining, allowing us to construct a semantic classification. We study the qualitative patterns of relations between endogenous disciplines within each classification, and finally show the complementarity of classifications and of their associated interdisciplinarity measures. The tools we develop accordingly are open and reusable for similar large scale studies of scientific environments. Our contribution therefore provides, besides the methodology, a new way to construct open databases and study journals for which data are difficult to obtain. The author would like to thank the editorial board of Cybergeo, and more particularly Denise Pumain and Christine Kosmopoulos, for having offered the opportunity to work on that subject and provided the production database of the journal. The author thanks Denise Pumain for helping with expert geographical knowledge in the naming of communities. The author also thanks two anonymous reviewers which comments were of great value for the paper. Banos, A., Chasset, P. O., Commenges, H., Cottineau, C., Pumain, D., & Raimbault, J. (2018). A spatialised bibliometrics approach of a scientific journal production. arXiv preprint arXiv:180807282. Barabási, A. L., & Albert, R. (1999). Emergence of scaling in random networks. Science, 286(5439), 509–512. https://doi.org/10.1126/science.286.5439.509, URL http://science.sciencemag.org/content/286/5439/509. Battiston, F., Iacovacci, J., Nicosia, V., Bianconi, G., & Latora, V. (2015). Emergence of multiplex communities in collaboration networks. ArXiv e-prints arXiv:1506.01280. Bourgine, P., Chavalarias, D., & al. (2009). French roadmap for complex systems 2008–2009. ArXiv e-prints, arXiv:0907.2221. Chen, S., Arsenault, C., & Larivière, V. (2015). Are top-cited papers more interdisciplinary? Journal of Informetrics, 9(4), 1034–1046. https://doi.org/10.1016/j.joi.2015.09.003, http://www.sciencedirect.com/science/article/pii/S1751157715300201. Dupuy, G., & Benguigui, L. G. (2015). Sciences urbaines: Interdisciplinarités passive, naïve, transitive, offensive. Métropoles, 16. https://journals.openedition.org/metropoles/5107. Gurciullo, S., Smallegan, M., Pereda, M., Battiston, F., Patania, A., Poledna, S., et al. (2015). Complex politics: A quantitative semantic and topological analysis of UK house of commons debates. ArXiv e-prints, arXiv:1510.03797. Mendeley (2015) Mendeley reference manager. http://www.mendeley.com/. Pumain, D. (2015). Adapting the model of scientific publishing. Cybergeo: European Journal of Geography. https://journals.openedition.org/cybergeo/26957. Raimbault, J. (2016). Torpool v1.0, https://doi.org/10.5281/zenodo.53739.